This shirt looks like it’s a very fine corduroy. It’s a nice chocolate brown, cut in the western-style Sam likes. The breast pocket flaps are double peaked and do up with two snaps. All the snaps on the shirt are white and diamond shaped. Sam wears it at the end of It’s The Great Pumpkin, Sam Winchester (4x07), when he is packing up his clothes and Uriel stops by to threaten him. In I Know What You Did Last Summer (4x09), Sam wears it at the end of the episode to meet up with Ruby and Anna at the cabin. 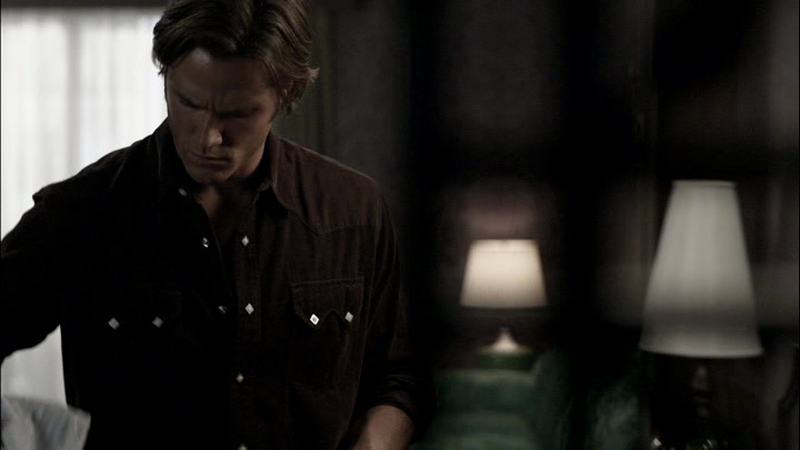 It is therefore also the shirt that Sam wears for the entirety of Heaven and Hell (4x10), except for the final scene when Dean tells Sam about Hell. In Dark Side of the Moon (5x16), Sam changes into it after they are resurrected. In As Time Goes By (8x12), Sam is wearing this shirt when Henry falls out of the closet. He continues to wear it the rest of the day, but takes it off before we see him sleeping in bed while Henry reads John’s journal. In Bad Boys (9x07), Sam wears this shirt at the very beginning of the episode, inside the Bunker, when Dean gets the call from Sonny. Love this shirt! I've always thought that the snaps make it look rather like a cross over his chest, and I think there might be some meta in the fact that it was the shirt he wore when he was resurrected in 5x16. Thank you for this excellent resource! I love it every time one of the boys wears a chocolate brown :) But that's neat about the cross, I never really looked at it that way before - but now that you mention it...This is one of the very many reasons I wanted to do this project! So much possible meta!